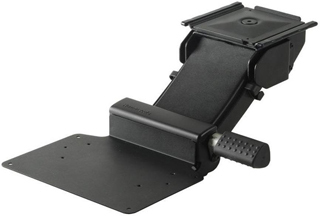 Humanscale 5G adjustable arm mechanism offers all the advantages of the keyboard arm 4G including simple dial a tilt keyboard angle adjustability but it has wider track for more stability. The new state of the art in keyboard technology the 5G combines easy dial a tilt and height adjustability with the strongest arm on the market. The Humanscale 5G is the premier keyboard mechanism from the worldwide leader of articulating keyboard systems. -Alternate Track Lengths 16" and 18"
-End of Track to Beginning of Platform 6"
-Max Depth Below Bottom of Keyboard 1/2"